When I first started blogging with my class in 2008, I thought it would be a bit of fun and a good way to communicate with parents. 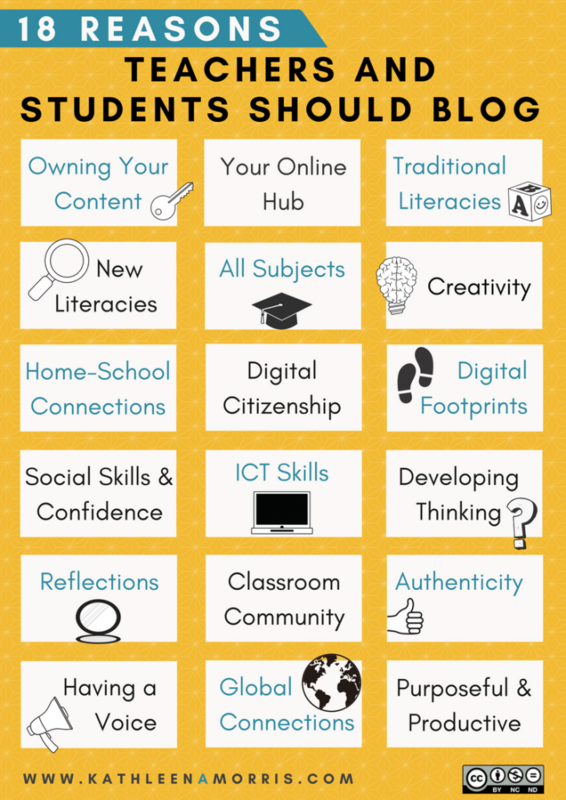 Over the years, I have come to realise that the benefits are much more than this and the more benefits I unravel, the more I am encouraged to make blogging a priority in my classroom. I have written about the benefits of blogging in an updated 2018 post. I have recently been reflecting on another benefit for certain students, after a number of discussions with parents. Over the past few years I have taught a number of students with Autism Spectrum Disorders (ASD) and observed how much a number of them enjoyed blogging. One parent recently explained to me why she thinks blogging works for her son who has Asperger’s Syndrome. Blogging has helped with his social skills, as not only does he interact with me whilst writing comments, replies and now posts he also has to think of appropriate ways to respond to questions, comments and the post. He also has a structure that he follows starting off with complimenting, which he struggles with due to his ASD, but since blogging I have seen an improvement. He then looks at the information they have written and tries to think of a way to engage the other person, this is also hindered by ASD, but again I have seen an improvement. Blogging allows him to be social without having to take pragmatic language into account, it also allows him to practice his skills in a non-threatening manner (not in front of others). Blogging has given him a way to engage with others as they speak to him at school about what he has written and give him praise about being a good blogger which helps with his confidence. He has also been able to put social skills into practice when assisting others with blogging. In a similar way, I have seen students without ASD but who are simply shy, quiet or lacking confidence really blossom through having a blog or working on the class blog. Students who have previously gone somewhat “under the radar” have found their voice and developed confidence by being a blogger. While some people may be quick to say that blogging and online social media can inhibit social skills, I see blogging as a terrific starting point. It can help certain individuals to practice their skills and transfer them into the “offline world”. There is no denying that they way we approach blogging in our class is highly structured and I think this works well for many students with ASD (and many other students). One example of this is the way we teach and encourage quality commenting which I see as contributing to the high standard of literacy skills my students are demonstrating. Note – I am not claiming to be an expert with ASDs or suggesting all individuals with ASD would respond to blogging but for a number of students I have taught, I have found it to be an effective tool that is well worth pursuing. Have you had any experience working with students with ASD and technology? What do you think about using online technologies to develop offline skills? Just awesome! Thank you for sharing this insight and parent’s thoughts. I’ve thought about the benefits of blogging for all students, but I never thought about the outcomes with students with special needs, including ASD. Light bulb moment! It’s funny how the more you get into the blogging, the more benefits and potentials you unravel! Thanks for your comment. I teach students with disabilities. My students don’t write the posts on our class blog yet, but I do find that the parents really value the blog. They enjoy looking at the blog with their child. It creates a fantasttic communication opportunity for kids who don’t have the ability to share what happened at school with their families, without some visual cues. That experience of kids being able to go home and communicate with their parents about their school life is just so powerful! Thanks for pointing that out. Many parents have commented to me that their child doesn’t tell them anything about school so the blog creates a useful talking point. I think it’s excellent that you are bringing awareness of new ways to interact, teach and the benefits of thinking outdside the square not only children with ASD but chilren in general.I think we all need to look at children as individuals and find the best way to pass on the information to them in a way that they find interesting which for many ASD children and even adults is through technology. Thanks so much for your thoughtful comment. As a teacher, it is just so fabulous to be able to hone in to students individual needs and interests. It is always rewarding to see how far they go when you can do this! This is an amazing discovery! I am an Integration Aide / Student Teacher and am always looking to integrate technology into lessons, assignments etc. It makes a lot of sense that (some) students with ASD would develop their social skills through this as it takes out the non verbal ques that some struggle to identify. I have been following these newsletters for a little while now and they have been a great help already, keep up the great work!!! Thanks for your support. I hope in your role as student teacher and integration aide you get a chance to try out blogging with some of your students. If you do, I’d love to hear how it goes for you! That’s an excellent discovery Kathleen. The great thing about this social media lark is the surprising benefits we make along the way. Great to hear another benefit am filing away for future use! @ Stephanie, thanks for your comment. Your support for other teachers and students is inspiring! I have taught a number of students with ASD, and have had great success with them blogging! Their parents are thrilled with the results, and regularly comment on their blog posts. One of my students from before that has autism (and was almost non-verbal when she started in my class) basically learned how to “write” thanks to our student blogs. By the end of the year, she was sharing all of her ideas on blogs, and even independently embedding work that she created in other programs (e.g., Wordles, Glogs, etc.). This was so exciting for her, as well as for her parents and me and the class to see! Blogging really can work well for all students! It’s great to hear that I’m not the only one who has seen benefits from ASD students blogging. What a fabulous example you shared. Inspiring! Thanks so much for taking the time to write a comment!